Ebola vaccine? Johnson & Johnson begins human testing of third, prepares to mass produce. A 16-year-old patient at an Ebola treatment center near Freetown, Sierra Leone. Johnson & Johnson has begun human trials of an Ebola vaccine at Oxford University and plans to have more than 400,000 doses available by April for larger-scale testing, according to new reports. At least two other vaccines are also in human testing stages, one developed by GlaxoSmithKline and the National Institutes of Health and another developed by Merck. Swiss trials of the Merck drug were restarted this week after being halted when subjects reported joint pain. The trial involves volunteers receiving an additional booster dose one or two months after the initial injection. Similar small trials will also get under way in the US and three African countries unaffected by Ebola. The rate of Ebola infections appears to be slowing in Liberia, but the disease is still raging in neighboring Sierra Leone. 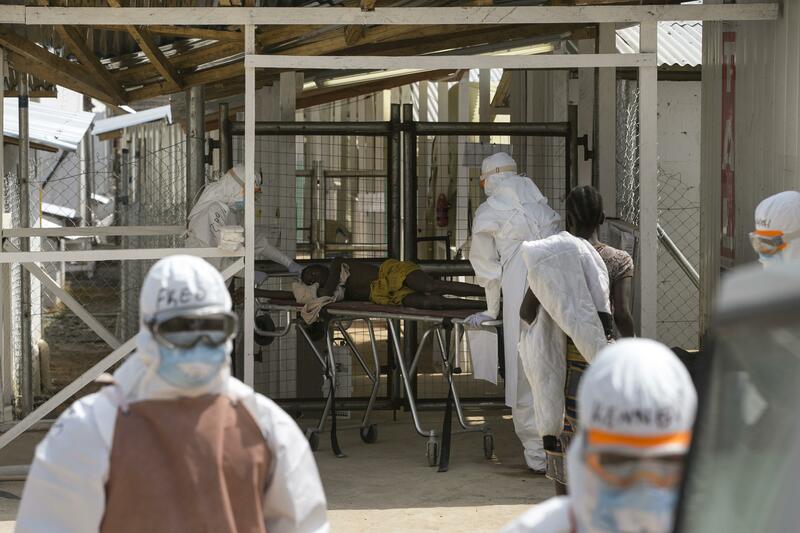 Ebola has also struck hard in Guinea; the status of containment efforts in that country is not clear from recent data, the World Health Organization says. More than 8,200 deaths have been attributed to the virus since the beginning of the outbreak.